Mazda introduced the Advanced New Mazda CX-3 as “the small SUV that’s a modern classic” in a new commercial running in Australia. 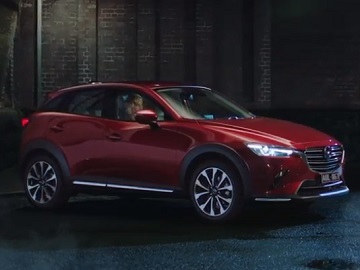 The spot features a blonde woman dressed in a long red dress leaving a movie theater, where she watched The Getaway, and getting into the new Mazda CX-3. Later on, she receives a phone call from a private number, which she answers from the car’s infotainment system, and asks the mysterious man at the other end of the line if he’s ready. When he confirms, she drives away and picks him up from a place where he searched for something in someone’s office. The two hit the road, together, at night, showing no sign of fear when they encounter a police officer on the side of the road. “It’s timeless design, state-of-the-art technolofgy and captivating performance, Advanced New Mazda CX-3 – A modern classic,” the voiceover says, adding the company’s longtime tagline, “Zoom-Zoom”. Designed with a sense of timeless beauty, the new Mazda CX-3 is “a bold and graceful example of Mazda’s signature Kodo design philosophy,” according to the automaker. A smart combination of driver-assist technologies and advanced connectivity is aimed at ensuring an outstanding drive. Active Driving Display, MZD Connect intuitive interface, which allows you to easily stay connected by providing from satellite navigation to hands-free music, texts and phone calls, sliding glass sunroof, 360 degrees view monitor, heated front seats, electric parking brake, parking sensors with reverse camera are some of the key features of the Advanced New Mazda CX-3, which also delivers an impressive mix of power and fuel efficiency to truly take your driving experience to a new level thanks to the breakthrough SKYACTIV TECHNOLOGY. In Australia, the CX-3 range includes Neo Sport, Maxx Sport, STouring and Akari as trims with FWD and Maxx Sport, STouring and Akari as trims with AWD. Earlier this year, in April, Mazda North American Operations debuted a new brand campaign during the NCAA basketball national championship game with the aim of making consumers “Feel Alive”. A 60-second ad from The Garage / Team Mazda, featuring a variety of people of different ages and races finding their bliss by doing what they love, introduced then the tagline “Feel Alive”.